I was by myself this evening so I decided to make an omelet and some fried potatoes for my dinner. I like a Western Omelet, which usually contains ham, bell peppers and onion and maybe some cheese. Well, I had no ham, so bacon took it's place very nicely. From what I've read, this omelet may also be called a Denver Omelet, or a Southwestern Omelet. Which ever name you call it, it is really delicious and so easy to make. The veggies can be sauteed until they are soft, or you can add them to the egg uncooked, which is what I did this time. Either way it's good. Pour the eggs in the skillet, top with the veggies and cheese. Add the bacon and fold over. Add more cheese if desired. And I love it served with salsa. Here's what I did. Beat the eggs and half and half, or milk, together and pour into a nonstick skillet over medium to medium-low heat. Stir in the onion, bell pepper and bacon (or ham); add salt and pepper. Loosen the edges of the omelet and tilt the skillet, letting the uncooked egg run to the sides. Add the bacon and the shredded cheese and fold the omelet in half when the eggs are still a bit wet looking. Take the skillet off the burner, add more cheese to the top on the omelet if desired. Place a lid over the pan to let the eggs finish setting and the cheese melt. 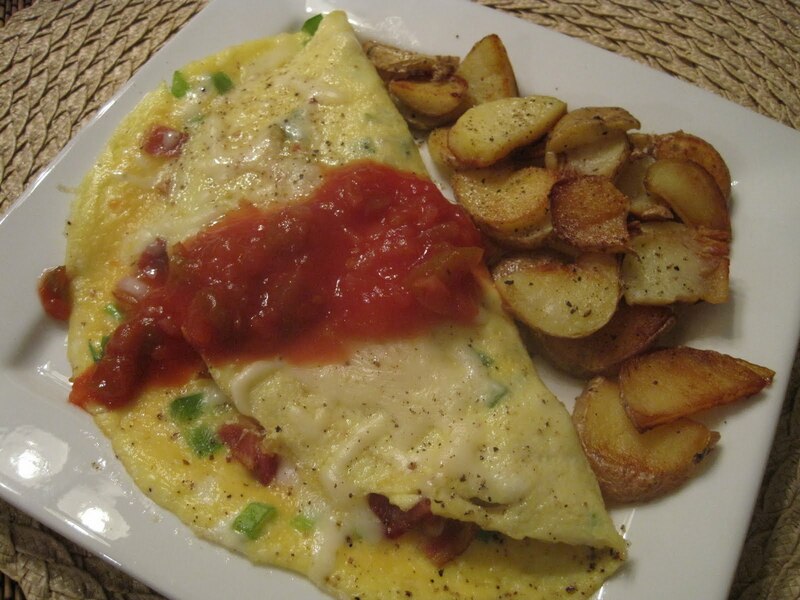 Slide your delicious omelet onto a plate, add salsa and devour. This is my favorite way to make an omelet. How do you like yours? NOTE: For the fried potatoes, I partially cooked 3 small Yukon Gold potatoes in the microwave. Then I sliced them thin and cooked in a little butter in a small skillet. Seasoned with only salt and pepper, they were golden, crisp and delicious. Another greateal Lynda - a good omelet and fried taters is hard to beat. 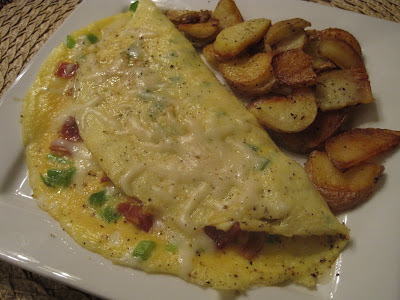 I haven't had a Western Omelet in ages, but now, I'm going to be craving one BIGTIME! I think your post is a sign! I kept going back and forth about buying a ham yesterday, but was worried that I would end up throwing the majority away since only my kids and I will eat it. (The smallest one was 8 lbs!). I bet my kids would love an omelet! Okay, you've convinced me...back to the grocery store! I often cook for one and an omelet is the perfect meal! This is my favorite combo and I love those spuds along side. I have eggs a lot for dinner. It's fast, I always have ingredients in the fridge to use and with bacon? Delish! I love a nice omelet. This one looks so great. Now I want one. 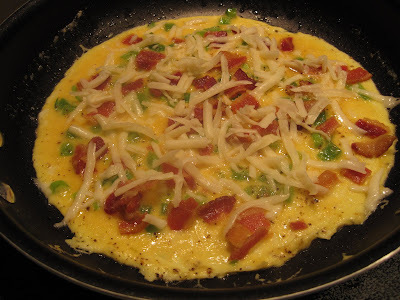 I love the toasted version of veggies in this omelet together with the bacon. I think it would add texture and extra taste. Haha. I've found a new love for my ordinary omelet, all the credits to you. My Nephew always orders that when we go out, and I always wondered what was in it. p.s. I wish I had seen the below post yestrday we tried to make milk gravy it and was terrible! Omelets are my favorite things to make when I have nothing else planned. Next time, I'm trying this flavor combo! Oh how I love the omelette. Nothing gets me through the morning like eggs! I love this omelette and all it variations - sometimes I keep a container of sauteed vegetables so people can make it easily. Eating alone can be delectable. and I certainly love your site! !